Asics running shoes is built with a purpose and a philosophy. Asics was established based on the principles of “A Sound Mind in a Sound Body,” which is the translation of the famous Latin phrase Anima Sana In Corpore Sano, or ASICS. This is why Asics designs its shoes not only to provide protection for a runner’s feet; each Asics shoe is designed to provide protection for a runner’s entire well-being. In such a way, Asics promotes total fitness and optimum performance. This must be a rather effective strategy in the creation of running shoes. After all, Asics is now a world-renowned leader in running shoes, and it has in its portfolio a robust collection of the best running shoes ever created. If you want a closer look at the best in Asics collection, here are the three most popular and bestselling shoes from the Asics brand. The Asics Gel Kayano is hands down the most popular shoe from Asics. Overpronators are definitely blessed to have such a shoe like this in their list of options. The Gel Kayano offers just the right stability and control but still adds some cushioning for moderate overpronators. The shoe series has recently released its 16th shoe in the line, and like its predecessors, the Gel Kayano 16 has once again offered overpronators the best possible combination of running shoe technologies. Featuring a Biomorphic Fit Upper for a snug and comfortable fit and an Asymmetrical Lacing System for a foot-specific fit, the shoe definitely holds feet stable and snug. To offer just the right level of cushioning for an overpronator, the Gel Kayano also features a Personal Heel Fit. The DuoMax midsole technology, on the other hand, offers cushioning but one that helps correct the degree of the foot’s pronation. This is definitely a monumental feature for overpronate shoes. 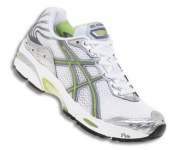 The Asics GT 2140 is the second most popular shoe from Asics. This shoe has remained a stable member of the Asics collection. It hasn’t been evolving as much as the other shoes from Asics. It has managed to maintain its star status, however, and is currently still one of the Editor’s Choice running shoes in Runner’s World shoe reviews. The shoe is a bestselling shoe for stability or for mild and moderate overpronators. It is equipped with some of Asics above-industry-standard technologies led by the IGS or Impact Guidance System. This technology features a linked componentry that allows the shoe to bend and move with the foot as it transitions from heel impact to toe off. This is then supported by a healthy cushioning system featuring lightweight Solyte material in the midsole. But to make sure that the cushioning does not make the overpronator’s problem worse, Asics adds in the DuoMax Support System and the Space Trusstic System to support the overpronator’s foot more effectively. One of the most successful running shoes Asics managed to come up with is the Asics Gel Nimbus, which is now on its 11th edition. Although the Nimbus initially had to face competition so that it would win in the cushioning division where it belongs, it didn’t take long for the shoe’s popularity to take off. The shoe is now available in both men’s and women’s edition, and the two versions offer the same great features but are gender specific because it uses the advanced Space Trusstic System. This technology allows the midsole to deform based on the pattern and shape of your feet, so the shoe can easily adjust to the different shapes and forms of men’s and women’s feet. If the three top Asics running shoes don’t offer what you’re looking for, you can browse through Asics’ healthy collection of products to find the shoe that fits your needs. Aside from the Kayano, GT, and Nimbus lines, Asics also offers the following other shoe series for various runners and different running needs. Runners differ based on the type and shape of their feet. Asics also offers different models and series for different foot types. One of the best in-between Asics running shoes is the Gel Kinsei. This shoe offers a mix of everything: stability, cushioning, and control. This belongs to the Guidance Line, which is characterized by vertical flex grooves that boosts the shoe’s gait efficiency. It also has a Heel Clutching System and Discrete Heel Unit to give better stability. The Propulsion Trusstic technology, on the other hand, guides the foot through the propulsion stage. It also comes with an AHAR Heel Plug for durable cushioning. And to give a great fit, it uses an asymmetrical lacing design and a biomorphic fit upper. The cushioning line is designed for underpronators who need a lot of protection for their feet. If this is the type you need, check out the Gel Cumulus, the Gel Speedstar, the Gel Stratus, the Gel Landreth, the Gel Kanbarra, Gel Equation, Gel Fluent, Gel Frantic, and several other shoes in the ever popular Gel cushioning line. Structured cushioning is the middle ground between cushioning and motion control. These shoes offer a little control and enough cushioning to find the optimal combination for mild overpronators. For this, check out the Gel DS Trainer and the Gel 1130. Instead of calling them motion control shoes, Asics calls them maximum support shoes. These are shoes for runners who overpronate severely. The top shoes in this section include the Gel Evolution, the Gel Fortitude, and the Gel Foundation. Runners also differ based on what kind of running they do a lot of. Asics offers running shoes for all runners regardless of what type of running they do. The best shoe for training from Asics is the Gel Kinetic. The Gel Kinetic series is relatively new. It was offered only in 2008. This is great for training because it is lightweight, so your feet won’t get beat up during training. The shoe boasts of four primary advantages: the IGS or Impact Guidance System which guides the foot’s natural movement, the Solyte Midsole Material which offers lightweight cushioning, the GEL cushioning which absorbs shock, and the discrete heel unit which offer stability. Are you into racing? Is speed top priority for you? You need a shoe that will boost your speed and not slow you down in any way. There are special racing shoes around and Asics offers the Gel Hyper Speed 2 and the Gel Bandito in this division. Are you into the extreme adventures? Does the rough, off road trail entice you more? Well, you should be considering the tough and rough trail Asics running shoes led by the Gel Trabuco, Gel Trail Sensor, and the Gel Kahana series. Asics running shoes have done a lot for the running industry. It has empowered runners, enhanced performances, and promoted healthy running. The company has also been the fortunate creator of various running shoe awards from Runner’s World for its top shoes. It has been a long journey from the time of Mr. Kihachiro Onitsuka, who established the original company which later became known as Asics. Asics Womens Shoe Built for the Female Foot - An Asics womens shoe is the best partner a woman can ever ask for when it comes to running. Asics has always been a leader in running shoes, but this is not even part of the top three reasons why female runners should trust the female-specific running shoes created by Asics. Asics Gel Lyte Make A Statement with Your Asics Running Shoes - The Asics Gel Lyte is often dubbed as the most stylish Asics shoe. It is in this shoe that Asics went all out with its knack for innovations. Defying the social conventions, the Asics Gel Lyte comes with a lot of color and packs a lot of punch. Best Running Shoes - Top Picks from Asics, Nike, AdidasWhat are the top running shoes from Nike, Adidas and Asics ? 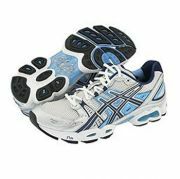 Kayano Shoes -The Asics Gel Kayano is the top selling shoe worldwise. Read this article to check out why. Cheap Running Shoes - Why not try and get some real discount deals when you're searching for running shoes ? Here are some tips. Best Nike Running Shoes - What are the absolute top and best Nike running shoe options out there ?